London, 31/05/2018 – Presently, ultra-deepwater Brazilian presalt prevails by delivering high productivity performance assurance to the industry expectations and to the government advantage, according to GlobalData, a leading data and analytics company. The top ten planned and announced presalt areas in Brazil will spend over US$220bn throughout their lifetime in capital and operating expenditure. These projects are Buzios I to Buzios V, Carcara, Libra Central, Sepia, Lula Oeste and Mero (Libra Noroeste), which together will contribute incremental capacity of 1.8 million barrels per day (bd) to global oil supply by 2025. Current producing and planned presalt projects are quite profitable and, in spite of the high upfront investment, their cash flows are extremely robust. 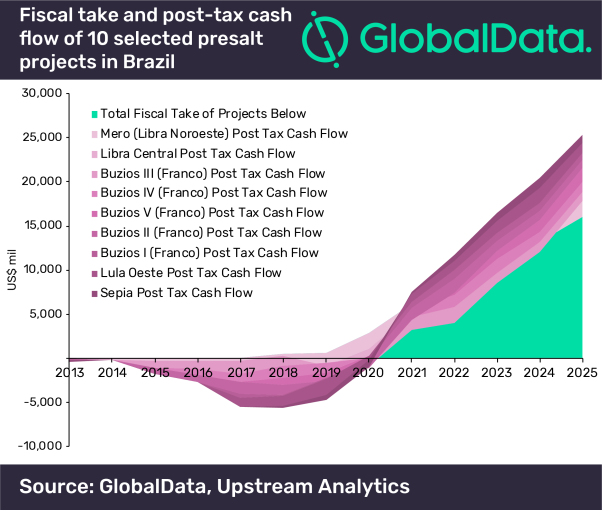 According to GlobalData, these top 10 projects will allow Brazil to double its total fiscal take by 2025 adding US$16.01bn and still have a total net post tax cash flow of US$10.8bn. According to GlobalData Upstream Analytics, on top of the 1.4 million barrels of oil from existing presalt producing fields, already accounting for 53% of Brazil’s oil production, an additional volume estimated at a minimum of 1.56 million bd of oil is expected by 2025 from other already awarded presalt blocks. In order to maintain Brazilian presalt success not only engineering virtuosity will be needed, such as the improvement in seismic reprocessing and reinterpretation through the salt layer, but it is also key to maintain a favorable investment and regulatory environment. In November 2016 the Brazilian congress approved a modification, which removed Petrobras presalt operatorship compulsory requirement and instead would allow Petrobras to have the right of first refusal over operatorship of newly offered presalt blocks.